As Wimbledon takes it’s traditional break today, we shall look back at the week that was of this years Wimbledon championship. This tournament has come with stunning memories, frustrating rain delays and surprises in both the men’s and women’s singles. 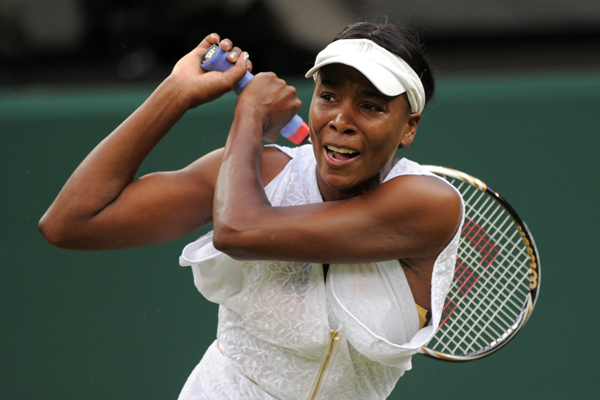 The headline news of the womens field is the long anticipated return of the Williams sisters. Venus returns after a hip muscle injury which sidelined her for the majority of the season. The four time Wimbledon champion faced the toughest battle against the 40-year-old Kimiko Date-Krumm who took Venus to the distance. However it was nerves from Date-Krumm which helped Venus in the end as she enters the 3rd round and now will play in the fourth. Venus Williams scrapes through an epic second round match against Kimiko Date-Krumm and is now in the second week of the tournament. For Serena, the comeback to Wimbledon meant much more. After winning the championships last year, she had an accident in a restaurant by stepping on glass. However this injury would then lead to several medical problems which put Serena out for 11 months. She now returns, more thankful than ever. She too has engaged in some battles with three sets against Aravane Rezai and Simona Halep. However she comfortably won the gruntathon between her and Maria Kirilenko which earns her a spot in the fourth round where she will meet and inform Marion Bartoli. Serena on fire against Maria Kirilenko. In the beginning of the tournament, many players are either delighted or disappointed with their location within the draw. But imagine how it felt for John Isner and Nicolas Mahut to verse each other once again in the first round following their longest ever match last year. This was the match that the sporting world was talking about. But many questioned if this sequel of the Isner and Mahut saga would be just as good as the first. Unfortunately, this match didn’t go the distance as many hoped. 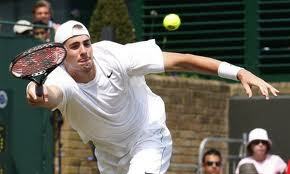 Isner successfully prevented another marathon, much to the dismay of fans, winning 7-6 6-3 7-6. It took nine hours less to win this time around. No marathon this time for Isner and Mahut. This years championships has also been shaken up by numerous upsets from both the mens and the womens side. The womens side has lost 4 of its top 10 seeds before the beginning of the second week. Australian Sam Stosur was the first to be ousted as she lost to Melinda Czink in the first round. The nexpected upset of the French Open Champion Li Na came next as she lost an epic battle with wild card Sabine Lisicki. Finalist Vera Zvonereva was favoured to be a finalist or even win this years championships, but last years semi finalist Tsvetana Pironkova had different plans as she got revenge by winning in straight sets. Schiavone was the last upset of the top 10, blowing several opportunities and losing 11-9 in their two day match against Tamira Paszek. Lisicki celebrates her win against Li Na. The score was 3-6 6-4 8-6. The top men have been more solid with Murray, Federer and Nadal all cruising from match to match. Djokovic faced a challenge against Baghdatis which lead him to boiling point and a smashed racquet. However he still ended up winning in 4 sets. Unfortunately, top 10 seeds Roddick and Soderling weren’t so lucky. Andy Roddick came in favour to win his match against the Spaniard in their third round clash, winning their last 7 meetings. But a big service game and a dominant and aggresive game plan lead Andy Roddick packing early, leaving a quarter final epic against Murray to never be fought. Another surprise was Robin Soderlings surprising loss against Aussie teenager Bernard Tomic. A stomach illness appeared to be troubling the Swede, but the Australian kept delivering different shots which frustrated the number 5 seed. After coming back two sets to love against Hewitt in the previous round, he was unable to pass another Aussie as Tomic wins the biggest victory so far in his career. 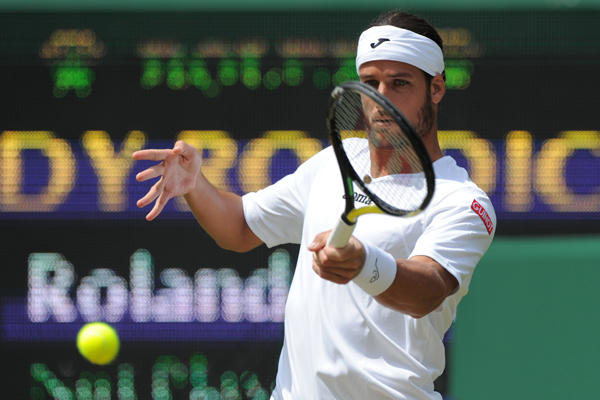 Feliciano Lopez shocks Andy Roddick in the third round. On of the surprising events of the tournament was the form of the two qualifiers in the mens draw. 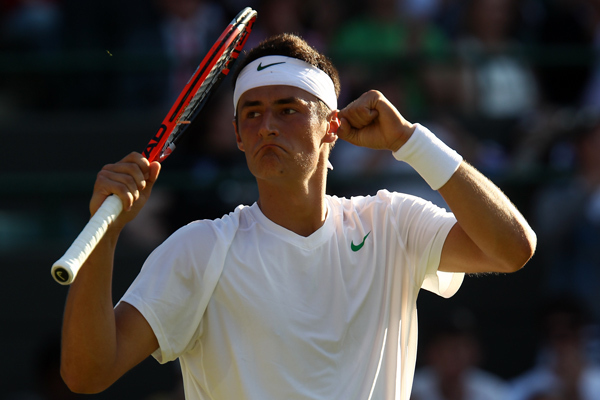 Bernard Tomic and Lukaz Kubot both came from qualifying and have now reached the fourth round. Kubot had a great run in back to back grand slams with a 3rd round appearance in Roland Garros. He ousted an impressive field of competitors from Ivo Karlovic, Arnaud Clement and Gael Monfils and will now face Feliciano Lopez. Bernard Tomic as mentioned before has had stunning run and shows signs of the future of Australian tennis after Lleyton Hewitt. After ousting Davydenko, Andreev and Soderling, he now faces Belgian Xavier Malisse. Tomic on a run at Wimbledon. Before we conclude, this years Wimbledon has also been filled with some hilarious moments. It started with Caroline Wozniacki crashing Novak Djokovic’s press conference and grilling him about his one match losing streak. Also Ryan Harrison had a hilarious moment during his shirt change. It seemed he couldn’t figure out how to put on a shirt. Also a first round match up between Americans Alex Bolgomolov Jr. and Donald Young had a intense situation turn awkward and comical. Watch below to see what happened. This concludes my review on the first week. For more posts on Wimbledon and tennis in general, subscribe or RSS to my blog. Also follow me on twitter for updates on current and future posts and events. If there is anyone you know who would enjoy this or should be recommended to, please share. Once again thank you for reading and feel free to comment on your view of Wimbledon. All images are courtesy of the official Wimbledon page. This entry was posted in Tennis and tagged 2011, ATP, Bernard Tomic Rafael Nadal, caroline wozniacki, first week, french open, Grand Slam, li na, novak djokovic, return, review, roger federer, roland garros, Sabine Lisicki, serena williams, tennis, upsets, venus williams, vera zvonereva, Wimbledon, WTA. Bookmark the permalink. Good stuff. Bernard Tomic has been playing good tennis. Nice to have a new up-and-coming Aussie player.